provide a basic meal and sometimes wonder where their next meal will come from. It is expected that this situation will continue until December 2011. Magarini a quiet town 50 kms of Malindi (situated on the Coastal Strip in Kenya) has been one of the worst affected areas; the people who reside in this area are mostly farmers. Due to short rains, erratic and poorly distributed long rains have resulted in poor or no farm produce at all. Last year this area was flooded and the farms were destroyed thus resulting in failure of food crops. This area has being facing harsh conditions for almost three years now. The communities have no access to fresh water or well water, they have to travel long distances to places where wells are sunk to receive briny water which is used for both domestic and drinking purposes. The main occupation of the people in this area is subsistence farming, cash cropping and fishing at small scale. 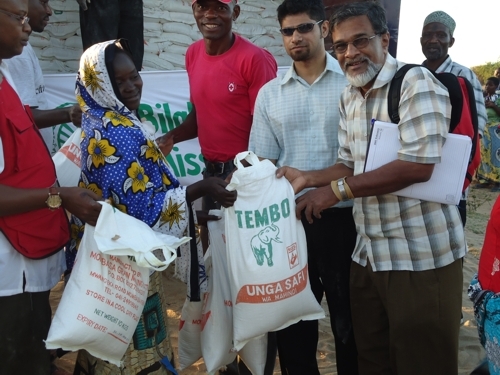 Bilal Muslim Mission of Kenya managed to liaise with local councilor and the Chief who arranged for the distribution of maize flour to the locals residing in that area. 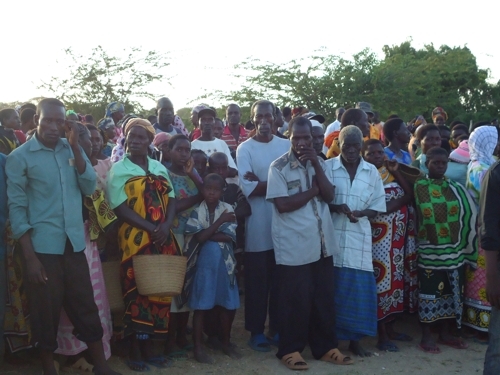 People attended the distribution in large numbers, men women and children to benefit from receive the relief aid. Over 3700 individuals have benefited from this Relief Distribution carried out by the Mission. 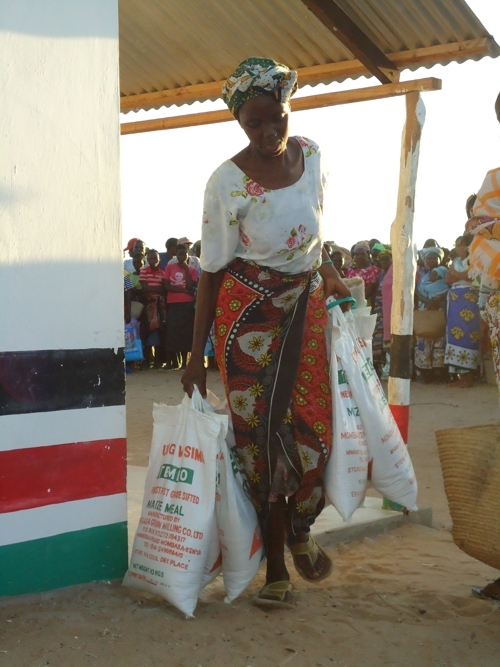 The distribution was done in conjunction with Kenya Red Cross, Mombasa and Malindi Branches. The team from Bilal Muslim Mission Of Kenya, Br. Mujtaba Peera, Br.B A Ahmedali, Br. Ammar Nyawa and Br. Ismail Were, alongwith team members from Malindi Red Cross Branch Br Hassan Musa, Sis Kauthar Mohamed, 7 Food Monitors, 8 volunteers and driver assisted in the distribution 19 tonnes of Maize Flour at Musumarini Village and Kurwa Kanagoni Villages, Fundisha Location, Magarini Division, Malindi District 40 km from Malindi Town with a population of 31,475 people. The team was received by Mr. Francis Kazungu, location chief and Mr. Stanley Karisa, area councilor. They appreciated the concern BMMK had undertaken for the sufferings of the people who are residing much further. They described the anguish and distress the communities faced all these years due to shortage or no rains. They conveyed their thanks and appreciations to all the organizations and individuals that had joined hands in donating generously towards this relief. The Mission records its appreciation to Jaffery Academy, Mombasa, KSI Jamaat of Mombasa and to all individual donors for their noble support enabling timely assistance to the deserving. “My location is worst hit because of the total crop failure. Famine has prolonged from last year up to this year. The food that has come will cater for 464 families. We appeal to other well wishers to come to our rescue because; many people could not get this ration. On behalf of the residents here I sincerely thank Bilal Muslim Mission Of Kenya for this timely support “. “The drought period was long and we had total crop failure. 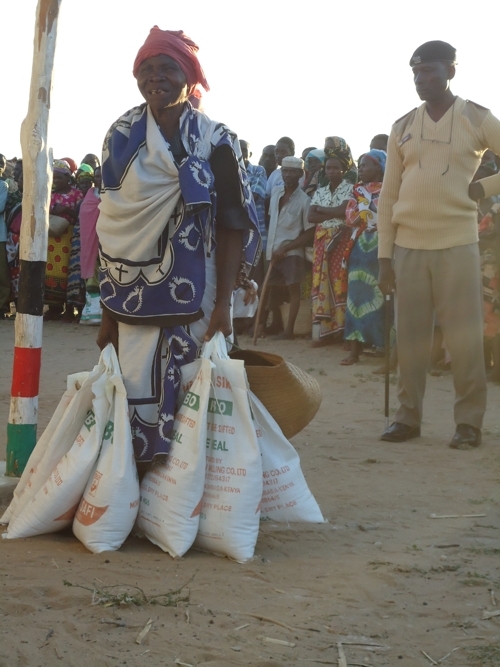 We appeal for more food aid to be able to cater for all of us”.